الموضوع في 'منتدى البـرامــج العـامــة' بواسطة AabedKhalifa, بتاريخ ‏سبتمبر 9, 2018. 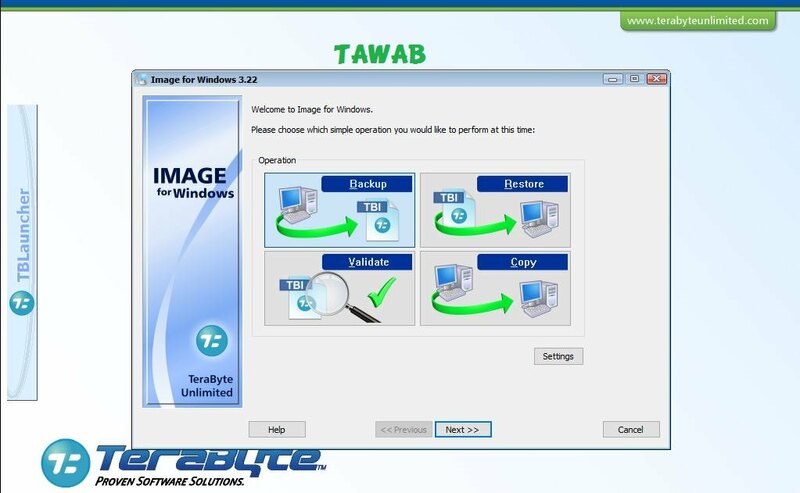 برنامج TeraByte Drive Image Backup & Restore Suite هامة ليقوم بالنسخ الاحتياطي للملفات ونسخ نظام التشغيل والملفات الهامة لحماية النظام والبيانات على جهاز الكمبيوتر المكتبي وأجهزة اللاب توب من الفقدان ، يسمح البرنامج لعمل نسخة احتياطية من جميع الملفات والصور والفيديوهات الهامة على الجهاز ودعم امكانية اختيار بارتشنات محددة او جميع البارتيشينات والملفات ، تستطيع ضبط البرنامج ليعمل نسخ احتياطى تلقائي للحفاظ على الوقت كما يمكنك جدولة النسخ الاحتياطي ليقوم بنسخ الملفات اوتوماتيكيا فى اوقات تقوم بتحديدها مسبقا ودعم انشاء ملفات مضغوطة بصيغة الايزو لتقليل المساحة ، يدعم ايضا البرنامج عمل نسخة احتياطية من الملفات على الاسطوانات واليو بى اس للحفاظ عليها من الفقدان واستعادتها بسهولة مرة اخرى وهو من أفضل برامج النسخ الاحتياطى للملفات. Image for Windows provides an easy and convenient way to completely backup all your hard drive's data, programs and operating systems. Your backups can be saved directly to external USB and FireWire™ drives, to internal or network drives, and even directly to CD, DVD, or BD. The suite includes an easy-to-use MakeDisk wizard for creating a recovery boot disk. To restore your data, programs and operating systems back to the way they were when the backup was created, simply boot the recovery disk and restore the partition(s) or drive(s) you need to recover. It's that easy. 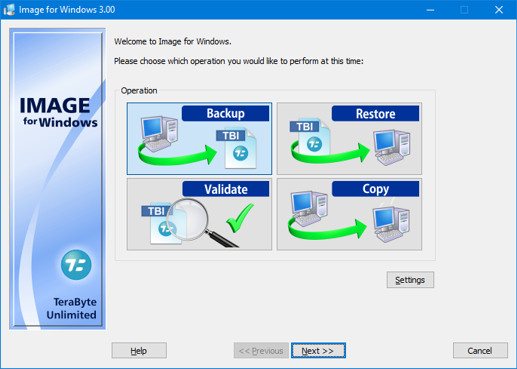 As a key component of the TeraByte Drive Image Backup and Restore Suite, Image for Windows utilizes the technology provided by Volume Shadow Copy Service (VSS) or PHYLock™, an add-on component included in the suite. VSS and PHYLock™ allows you to continue using your computer while the backup is locked to a point-in-time. This eliminates the inconsistencies typically experienced while backing up a partition that is in use. Provides the option to verify each and every byte it backs up. Runs directly from Windows and when used with the free PHYLock™ add-on, it can create a true image of the Windows partition itself, without requiring a reboot. Your backups can be secured using simple password protection, or full 256-bit AES encryption. Change only backup option allows you to backup only data that has changed since the last backup was created. Easy to use the first time, and every time. Fast, yet reliable techniques are used to create the backups quickly. You can save directly to a CD, DVD, DVD-DL, BD. Whenever you save directly to a CD, DVD, DVD-DL, BD, it will automatically become a bootable restore disc. GPT compatible supporting drives larger than 2TiB. Using the free TBIView and TBIMount add-ons, you can view the contents of the drive image files, and optionally restore individual files or folders within them. Supports both Workstation and Server versions of Windows. Supports multicasting to reduce network traffic when deploying multiple Workstations. Includes Image for DOS, Image for Linux, and TBOSDT at no additional charge, making it a uniquely affordable and complete disk imaging solution. Restore partitions, regardless of the file system on the partition being restored. This gives you the power to restore NTFS partitions from Windows 98 or even DOS (as just a couple of examples). Compatible with NVMe, SAS, SCSI, PATA, SATA, USB, IEEE 1394, and more. Using Image for DOS or Image for Linux (each of which is included with the purchase of Image for Windows) versions gives you the ability to recover your data, even if Windows won't start. Save backups to any drive accessible to Windows itself. Works seamlessly with on-board hardware- and firmware-based RAID. Powerful, complete command line support is built in, allowing you to automate backup or restore procedures. Leverages the built-in Windows scheduler via the simple click of a Schedule Backup button. Allows you to thoroughly check the integrity of the disk image files, either as part of the backup process, or at any time thereafter. TeraByte imaging products are renown for their thorough and accurate validation process. When restoring an image, you can expand the restored partition to occupy any free space that would be left over. If desired, you can specify a maximum size for the disk image files that are created. This allows you to create image files that readily fit on the removable media of your choice. Restore Windows to completely different hardware and then use the TeraByte OSD Tool Suite to install the drivers required to support the new hardware. Scripts included to automatically convert your physical machine to a virtual machine, either directly or from a backup image. Convert your virtual machine to a physical machine using the included scripts. - Add /lvm (LVM) option to support data-only areas of self contained LVM partitions. - Add full support for exFAT. kashif.am ،أبو عائشه ،shakaboom_09 و 7آخرون معجبون بهذا. أبو عائشه و AabedKhalifa معجبون بهذا. AabedKhalifa و Obito معجبون بهذا. حالياً أقوم بتجربة أسطوانة الإقلاع ولكني وجدته به صعوبة بعض الشيء حيث أريد عمل نسخة إحتياطية للويندوز والذي هو في البارتيشن C ولكني لم أستطع عمل لي نسخة إحتياطية لكامل القرص الصلب بأقسامه المتعددة وأيضاً لم أجد ميزة ضغط النسخة الإحتياطية من ضمن الإختيارات ربما لم أكن على دراية كاملة بكيفية التعامل مع كيفية عمل نسخة إحتياطية للنظام . الخلاصة : مثل سهولة وقوة برنامج Acronis True Image بصراحة لم أجد من خلال تعاملي مع غالبية برامج النسخ الإحتياطي فكانت بدايتي مع الجوست إبان إستخدامه من قرص عادي فلوبي ديسك ثم تقدم بعد ذلك وعند مجيء برنامج Acronis True Image سحب البساط منه وبرأيي أصبح الأكرونيس هو المتربع حيث أنك لو استخدمت الإصدار الأول من البرنامج بنسخة احتياطية وجئت تعمل إعادة للنسخة الاحتياطية بآخر إصدار تجده يعمل معك وبنفس السياسة عكس بعض البرامج الأخرى كل ما تتطور لا يمكنك استخدام نسخ بإصدار قديمة وتفتحها بإصدار جديد .